I think today’s topic was too broad. And, I had too little time. I really didn’t have much time to pull out my camera until 6pm, when the sun was already going down. I do like this photo, but I’m not sure it captures focus. 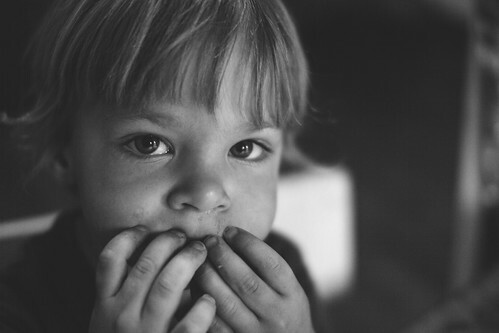 His main focus here was stuffing his mouth full of goldfish crackers. I actually took two others that might fit the prompt a bit better, but I’m not sure anyone wants to see a leaf or a huge spider. In case anyone does: picture of a huge spider & generic picture of a leaf. Now, if you aren’t totally grossed out because you couldn’t resist clicking through to the spider photo, pumpkin muffins! A friend commented and asked for the recipe, so I will share. Just a note, this is not my recipe. It originally comes from a Better Homes and Gardens Cookbook. 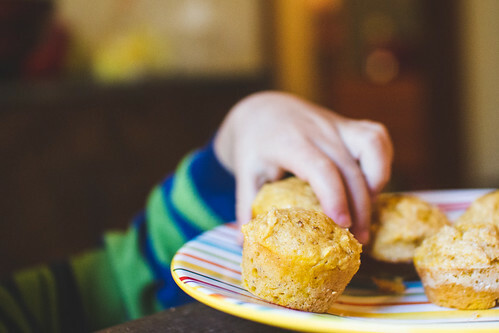 My mom made these pumpkin muffins for years and they’ve always been a hit. The original recipe calls for raisins, but I’m not a fan. Preheat over to 400 degrees. Mix wet ingredients separately from dry ingredients. Gently mix the dry ingredients into the wet, until just incorporated. Scoop into muffin tins. Sprinkle with sugar. Bake for 18-20 minutes for regular size muffins (10 minutes for mini muffins). They’re really best just after they cool enough to eat. Still warm, SO yummy.